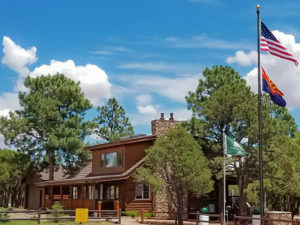 Mogollon Airpark – "Arizona's Finest and Friendliest Airpark"
Mogollon Airpark (AZ82), Arizona’s premier fly-in aviation community, is located in the majestic White Mountains of Eastern Arizona. At an elevation of approximately 6600′, summers are pleasant and the winters mild. Recreation abounds with something for everyone… fishing, hunting, hiking, boating, camping, nature-watching, cross-country and downhill skiing. Only 90 nautical miles northeast of Phoenix, the nation’s fifth largest city, Mogollon Airpark offers the perfect mix of an easy, laid-back lifestyle but with convenient access to all the amenities a major metropolitan area has to offer. 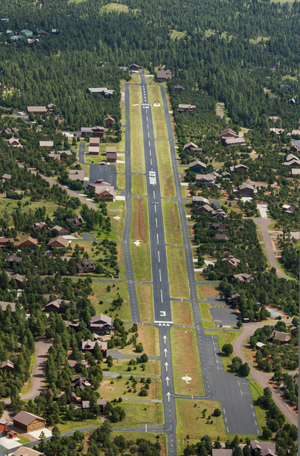 With its 3,436′ X 50′ paved runway and parallel taxiways, Mogollon can accommodate most general aviation aircraft. The airpark is comprised of 254 residential lots, many with direct taxiway access, and is home to a vibrant and active pilot community. In addition to the almost weekly fly-outs, there is a large homebuilder community with numerous experimental aircraft in various stages of construction. AZ82 is also the proud home of EAA Chapter 1044. On top of its aviation amenities, the airpark also features a tennis and basketball court, a community lodge and picnic ramada area with BBQs… where most Friday nights you’re likely find homeowners gathered enjoying the weekly barbecue. Mogollon Airpark (AZ82) is a day-use-only private airport. Guests are always welcome upon submission of the Prior Permission Form AND after reading and agreeing to the Mogollon Airpark Operating Guidelines – Aviation.